NEWPORT  About 800 of the over 27,000 people living in the Crosby area attended an April 16 public meeting about the proposed widening of FM 2100 from FM 1960 to South Diamondhead Blvd. The proposed is a $79.3 M. cost of construction to begin this Summer and last 3.5 years to make the current two opposing lanes into two travel lanes in both directions with a raised median and two five foot sidewalks on both sides throughout the eight miles in Crosby and Huffman School Districts. 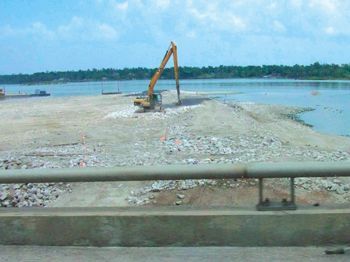 According to Texas Department of Transportation, TXDoT, the proposed improvements would need 107 acres of additional right-of-way, including right of way for storm water detention pond construction. Six residences, eight commercial structures and two churches would be potentially be displaced as a result of the proposed project. A series of fatal accidents, planned development north of Humble, planned development near Mont Belvieu, planned development near the Baytown area, the coming of the Grand Parkway, plans for the Houston Ship Channel to become a significant port to service the Panama Canal begin to answer the first and third questions. The second has much to do with $79.3 M. while billions of roadway dollars construction is ongoing in the west side of the county. Although oil prices took a slide, demand for homes has not abated. Another factor is that local Republicans have heard the call from business throughout Texas for better ways to get where business and employees need to go. TXDoT is still taking comments until April 30 and will post them on their website. Write to them at TXDOT Houston Office, 7600 Washington Ave., Houston, Texas 77007 or e-mail hou-piowebmail@txdot.gov and the project website is http://www.txdot.gov/inside-txdot/get-involved/about/hearings-meetings/houston/041615.html. Harris County Attorney Vince Ryan today appealed trial court rulings in the case involving the contamination of the San Jacinto River. County Attorney Ryan filed a Notice of Appeal in the case of Harris County and the State of Texas v. International Paper. The case involves the contamination of the river by International Papers predecessor Champion Paper in the 1960s, when Champions Pasadena Mill disposed of dioxin-laced paper mill waste in pits dug on the river bank. The waste leaked into the river for more than four decades, where it has contaminated the water, the sediment and the fish. The case was tried in October 2014, with a group of companies settling with Harris County and the State for $29.2 million before the jury returned its verdict. The County is appealing on the grounds that the jury was not permitted to hear key evidence from experts and witnesses who live and work near the river. The trial court excluded reports from the Environmental Protection Agency and the Texas Department of State Health Services about International Papers pollution of the San Jacinto River and endangerment of the people of Harris County with dioxin exposure. Harris County is also appealing the trial courts instructions to the jury that took many of the factual issues out of the jurys hands. Among other findings, the court ruled as a matter of law that once the waste was pumped into the pits, it was no longer Champions waste despite the fact that the company hired to dispose of the waste also disclaimed ownership of the waste as well. The court also held the jury could not hear evidence that Champion had done the same with another site in Texas. Under that theory, any polluter could escape punishment by giving waste away, and they would no longer be responsible for it, Ryan said. On April 6 the trial court overruled Harris Countys Motion for New Trial, clearing the way for the appeal. Vince Ryan will ask the Harris County Commissioners Court to use the funds from the $29.2 million settlement for environmental projects that will benefit the people of Harris County who were most affected by the contamination. HIGHLANDS  A jet ski accident involving 5 friends, took the life of a 21 year old man last Sunday afternoon at Banana Bend Beach. According to Capt. Don Stanton of the Sheriffs Marine Division, two young men on a jet ski were towing an inner tube with two others on it. A second jet ski, driven by a friend of theirs, followed but lost control and ran into the tube. The result was that the two men on the tube were thrown into the water. One resurfaced, but the other lost his life vest, and did not. Emergency personnel were called about 11:50 on Sunday morning, and after an extensive search by two patrol boats, the body surfaced and was recovered about 1:24 according to Stanton. Witnesses said that the boy that survived received CPR at the site, but did not require transport to a hospital. The victim is a 21 year old Hispanic male, but his name has not been released. Standing by to aid in the recovery were the Highlands EMS and Fire Department, and ESD#5 EMS from Crosby. 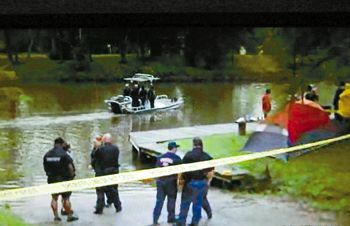 The deputy said that preliminary investigation indicated that the driver of the second Jet Ski was not familiar with its operation, contributing to the accident. Other factors such as alcohol are being investigated. No charges have been filed in the accident, Stanton said. Huffman Middle School Boys Coaching staff are being recognised for their outstanding performance this year. 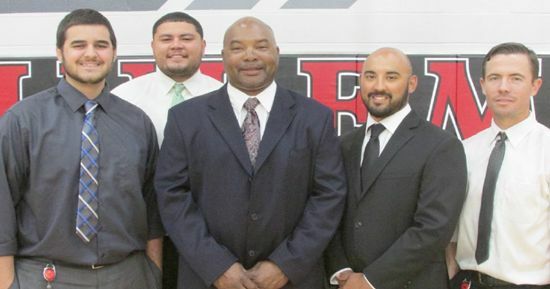 They will be awarded the 4A and under Junior High Coaching Staff of the Year by the Greater Houston Football Coaches Association (GHFCA) on May 6th at the University of Houston.The coaching staff includes: Jerry Bradford, Chad Merchant, Earnest Pena, Chaston Pruitt, Bryan Moore, & Alex Alvarez. 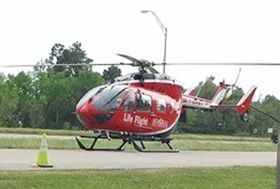 CROSBY  An eleven year old was riding his ATV Saturday at about 3:40 p.m. near Down South Off-Road when a car pulled in front of him. The driver swerved to miss the car but the resulting accident apparently caused some trauma to they young drivers chest. After Gulf Pump Road was closed and rescue squads responded again this week, it was deterined that no rescue was needed. Drivers on the Beaumont Highway and vicinity need to be aware of the RackRock & Concert from April 17 until April 19. 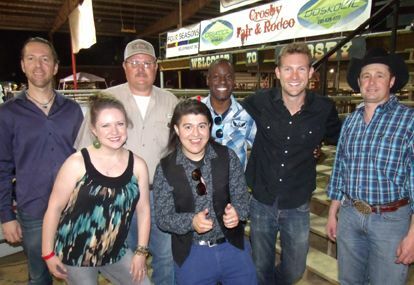 CROSBY  Certainly a lot of records were smashed for the Crosby Fair & Rodeo Spring Dance that added a lot of spice with Crawfish Shacks famous fair, vending by the Crosby-Huffman Chamber of Commerce and renowned and soon to be renowned live music performers. The auction at the First Annual Rockin C Crawfish Festival brought $27,150 and that did not count the silent auction. Bill Busby called the auction and cited it as the most raised. Generally, the Rockin C Arena was about half full the entire venue that began at 3:00 p.m. and continued until Sunday wee hours. The original band was the Kingpins with a varied style that went throughout the wide field of Louisiana style. The big delight of the night was the crawfish and then extra special was Uptown Drive. The story goes that Rick Loggins, Ricky Larkin and Shane Welch had been to Luckenbach, Texas looking for acts to play the rodeo and Spring Dance. The story continues that somewhat frustrated the troop had stopped on their way back in Fredricksburg at a show and beverage location. While they were there a band came on playing everybodys favorite in all the popular music genres save Bob Wills style. According to Shane Welch their boots were knocked off their feet. Everybody got along and the act came to find a new fan base in Crosby. Uptown Drive out of Austin played, Chain of Fools so much like the original version this reporter was unsure if it was the most clear radio ever or live until walking near to discover it was being played by the performers on stage. The group played for hours without a drop in the vibrant energy or waiver in tonal quality. The crowd thronged next to the center of the Rockin C to begin the live auction where seating had been placed for one of the largest crowds to attend the auction. At the close of the night  Johnny Lee was a little hoarse but played on with the lively Urban Cowboy Band that could pick about any country lick including like Mickey Gilley. There was something for anyone this year and the next promises to be even more of a thrill.